One of the best ways to improve the aesthetic appeal of your Instagram gallery and feed is to increase the amount of white space between your photos for a clean, uncluttered look. The white border you choose will depend on your overall Instagram theme and whether the photos you’re uploading are horizontal, vertical, or square. If symmetry is your thing, then a white frame for Instagram photos is a great way to go. 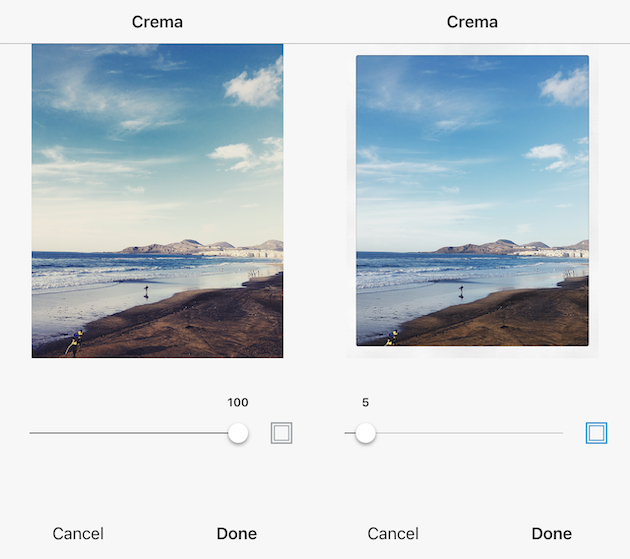 Here are a few simple ways to achieve a white border on Instagram. The easiest way to get white borders on Instagram is to use the native Instagram app. If you navigate to your profile page, you’ll see that your photos all show up as squares with a thin white border between them. This is lovely, but there’s a more striking white border that you can add to your photos. In the Instagram app, tap the + icon to add a new photo. Choose a photo that you want to add to your gallery. Tap Next in the upper right-hand corner. Filter should be active now. If you want to use a certain Instagram filter, swipe through and choose one. Even if you want to keep your photo as is, choose a filter for now. Double tap on your filter of choice. You’ll see a slider and next to it a square. Use the slider to choose the strength of your filter. If you want to keep the original look, just move the slider all the way to the left. Tap on the square. This will add a white border to your photo. Now tap Done, and then Next. Add your caption and tap Share. Your photo will show up in your gallery with a white frame. If your Instagram app is set to automatically save all posted photos to Camera Roll, you’ll end up with two copies of every photo you post — with and without the border. 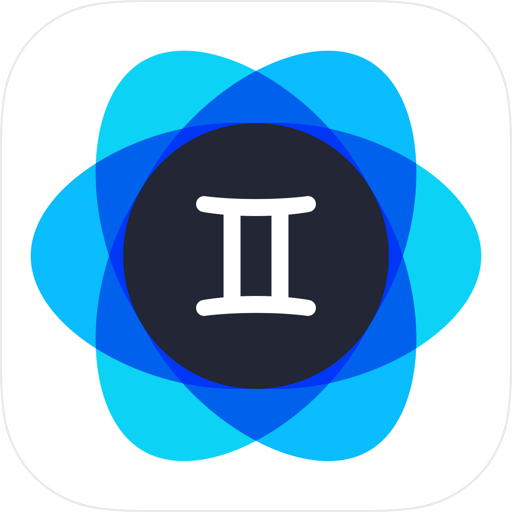 An iPhone app like Gemini Photos will help you find and delete those redundant copies. As fabulous as the Instagram app is, you can really only achieve one border style using the Instagram editor. 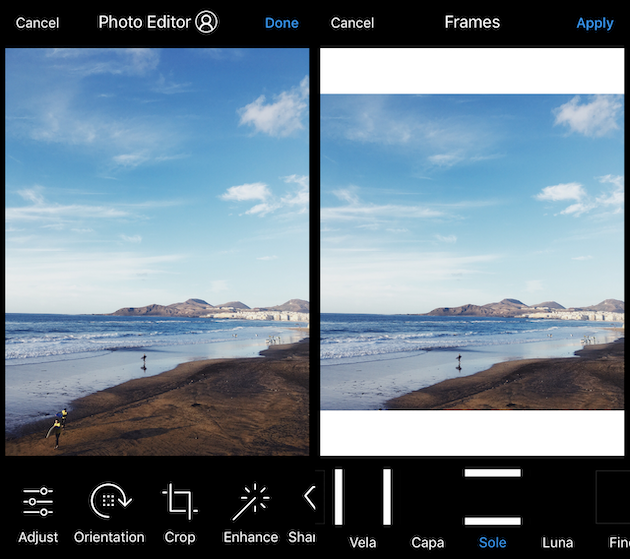 If you’re looking for a thicker border or a way to add asymmetrical borders to horizontal or vertical photos, you’ll need a third-party app. Here are a few we’d recommend. 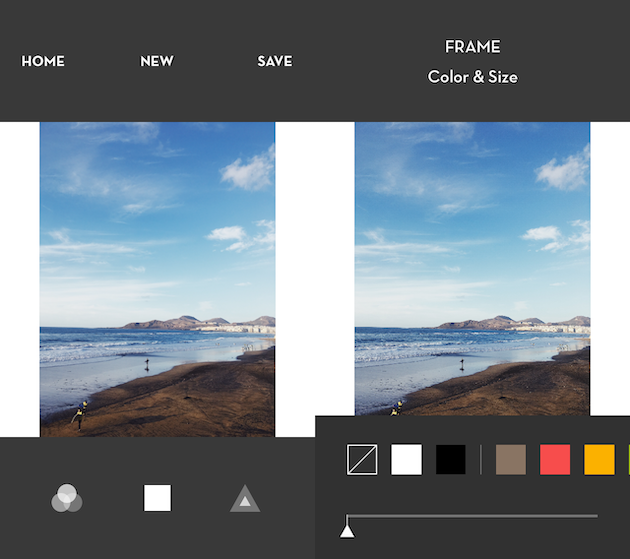 The Preview app is an Instagram planning and editing tool that has a selection of white borders you can choose to create a unique Instagram theme. If you are going to edit your photo or apply a filter, be sure to do it before you add your frame because a filter will change the color of your photo’s border when added afterwards. Open the Preview app on your phone. Tap on the plus sign in the upper right corner to add a photo. Go to Library > Camera Roll (or an album) and choose a photo to upload. Tap the shutter icon at the bottom of your screen. Tap on the editing icon, which looks like three horizontal lines with tabs through them. Select the border you would like to use on your photo. There are more than 30 frames to choose from. Tap Apply, Done, and then Save. Now you can either save the photo to your Camera Roll or post it right from the app. With Whitagram, you can upload any photos of any kind — square, portrait or landscape — and quickly add a white border before uploading your photo to Instagram. Download and open the Whitagram app on your phone. Tap Library and choose a photo from your Camera Roll. Tap on the square icon at the bottom of the screen. 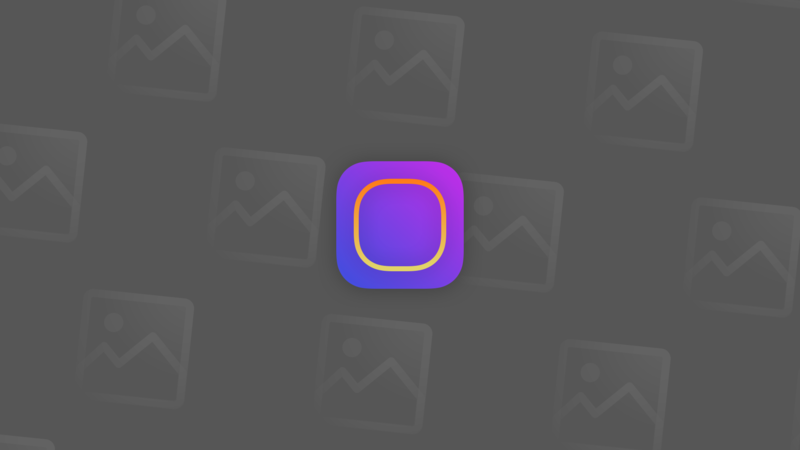 Tap on the white square to choose a white border for your Instagram photo. Move the slider at the bottom of the screen to choose how wide you want your border to be. Squareready allows you to add a white, colored or patterned border to your photos, no matter the original dimensions. With Squareready you can also move your photo around within the frame, making it off-center for a unique look. There’s also a simple, in-app editor for basic touch-ups. Download and open the Instasize app on your phone. Tap the square face in the middle of the screen. Your Camera Roll will appear on the screen. Choose the photo that you want to frame. Choose one of two crop options if you are working with a landscape or portrait photo. This will allow you to use the borders without cropping to a square. Tap on the frame icon. Tap on the colored circle on the bottom left of the screen to choose the border color. When you're finished, tap on the green check mark, which will allow you to save your photo and upload it to Instagram. If you’re looking for ways to make your Instagram account stand out, consider using one of these methods to add a white border around your photos. This is a great trick for adding visual appeal to your gallery and giving your Instagram feed a distinct look.